During the summer and fall of 2008, Thomas Doty and Roy Phillips of the Reading the Rocks Project worked with the Talent Historical Society and Desiesque Designs to create the Medicine Rock Exhibit. The exhibit includes a rock patterned after a portion of the Medicine Rock site as well as photos, descriptions and interpretations. 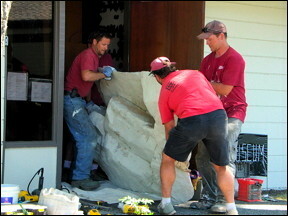 The rock is located at the entrance to the society's museum in Talent, Oregon. The Meyer Memorial Trust funded the project. The exhibit was dedicated on October 18, 2008. The evening included a talk and blessing from Takelma elder Agnes Baker-Pilgrim, presentations by Thomas Doty and Roy Phillips, and traditional drumming and singing by Whistling Elk.